The project dashboard gives you an overview of the status of your project. Todos - shows the current state of all the Todos on the project. Project Budget - shows the overall spend (i.e. Time Worked + Additional Costs) on the project against the overall budget. Project Status - this shows the overall progress in hours spent on the project. Latest Activity - the most recent activity on the project. Issues - highlights any problems currently with the project. 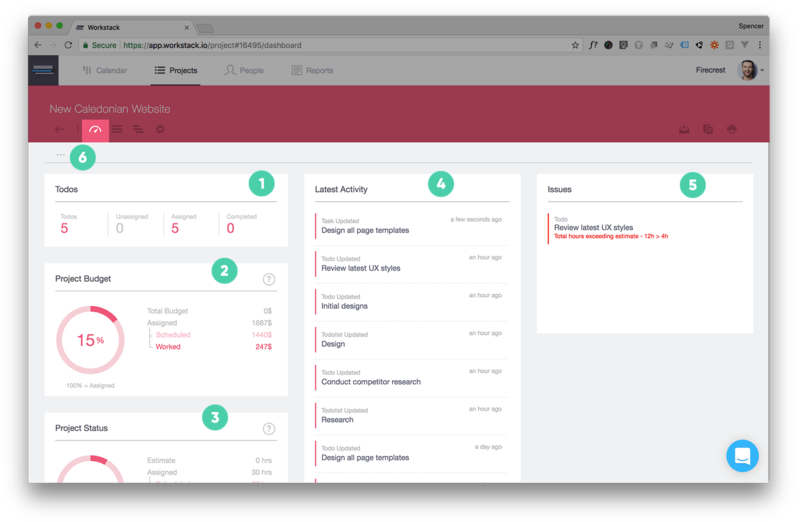 Configure - set which elements you want to see on your project dashboard. Provides a high level overview of the state of play with all the Todos on the project. Total Budget - This is the amount of money budgeted to complete the project. This is optional so if you don't set this then it's automatically calculated by combining all the estimates of the Todos that make up the project. Assigned - This is the total cost of all time worked and currently assigned on the project - it's the total cost of Scheduled hours + Worked hours. Scheduled - This is the total cost of all the work that's been scheduled to people but hasn't been completed yet. Worked - This is the total cost of all work that's been scheduled to people and has been completed. Remaining - This is the remaining spend available within the project budget. If you have surpassed the project total budget then this will show as a minus figure. Donut Chart - This is the amount of spend on the project as a percentage. If no budget has been set for the project then the total is calculated from the Assigned figure. Total Budget - This is the amount of time estimated to complete the project. This is optional so if you don't set this then it's automatically calculated by combining all the estimates of all the Todos that make up the project. Assigned - This is the total time of all time worked and currently assigned on the project - it's the total time of Scheduled hours + Worked hours. Scheduled - This is the total time of all the work that's been scheduled to people but hasn't been completed yet. Worked - This is the total time of all work that's been scheduled to people and has been completed. Remaining - This is the remaining time available within the project estimate. If you have surpassed the project estimate then this will show as a minus figure. Donut Chart - This is the amount of time worked on the project as a percentage. If no estimate has been set for the project then the total is calculated from the Assigned figure. This is a list of all the latest activity on the project starting with the most recent first. Due date of a Task / Todo has been exceeded. Amount of time worked has exceeded the estimate. Amount of time assigned has exceeded the estimate.